A few months back, the fine folks at Walnut River Brewing invited us to El Dorado to work on our very first beer! WRB has done several collaboration brews but since it would be our first, we wanted to make a beer that would appeal to our tastes and our regulars', and also complement Walnut River's excellent lineup. Our bartender Daniel decided our collaboration brew should be a Bière de Garde, a strong farmhouse ale traditionally brewed in the North of France during harvest seasons. They are usually aged in bottles and put away to make sure there was enough to drink all winter long but thankfully our Vieille Lune Bière de Garde is ready to be appreciated NOW! Vieille Lune Bière de Garde is a medium body ale with a toasted malt aroma and an earthy sweetness. 7.2 % ABV • 23 IBU As you sip it, imagine Daniel and Schane helping the Walnut River brewmasters bring this brew to fruition. We're pretty pleased with how it turned out. 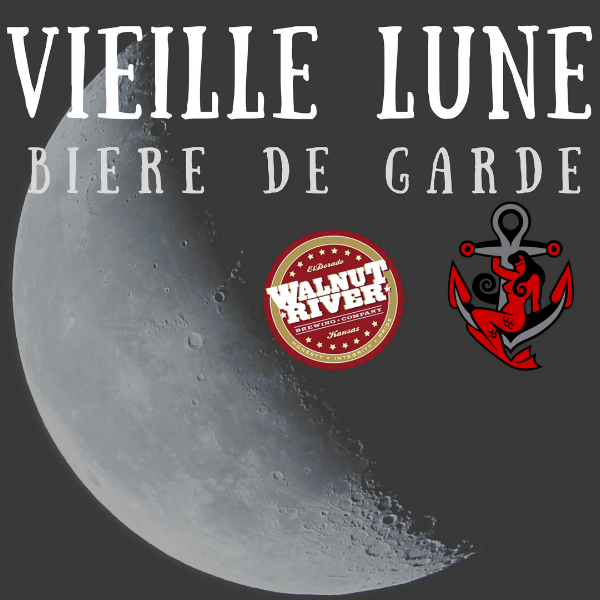 Try Vieille Lune at The Anchor or at Walnut River Brewing and let us know what you think!